Rosen had an up-and-down rookie season after being drafted out of UCLA, throwing for 2,278 yards and 11 touchdowns with 14 interceptions. The hiring of former Texas Tech coach Kliff Kingsbury during the offseason changed the dynamic in Arizona. Kingsbury's wide-open offense put up prodigious numbers in Lubbock and twice produced the national leader in passing yards. The 39-year-old coach has brought his pass-first offense to the desert and Murray seems to be the perfect fit to run it. Kingsbury even recruited Murray to Texas A&M when he was the offensive coordinator there in 2012. Though small for a quarterback at 5-foot-10, Murray is strong-armed and shifty. He threw for 4,361 yards and 42 touchdowns with 11 interceptions at Oklahoma last season, and added 1,001 yards and 12 more touchdowns on the ground. 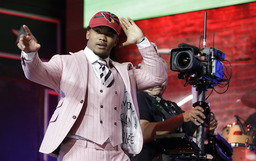 A backup to Baker Mayfield in 2017, he followed in the footsteps of his former teammate by winning the Heisman Trophy and being taken with the No. 1 overall pick a year later. Mayfield, now with the Cleveland Browns, quickly congratulated his successor in Norman. The Cardinals had been on the clock for three months, yet have seemed to have a hard time deciding what to do with the fourth No. 1 overall pick in franchise history. 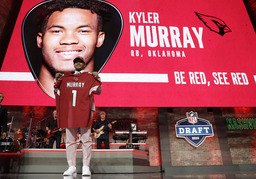 Murray's decision to play football instead of baseball added a layer of intrigue, even with Rosen on the roster. 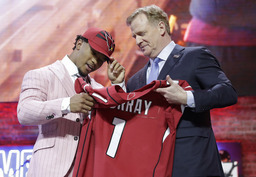 Arizona's brass said it was still undecided days before the draft, leaving fans and media wondering if they would take Murray, pick a defensive player or trade down and get more value. 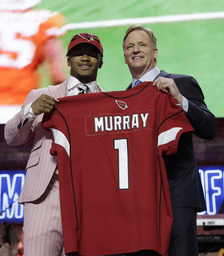 It ended up being Murray, giving the Cardinals two top-10 quarterbacks - and some decisions to make.